Shipping on orders up to $50.00 is free; for each $50.00 over that amount, shipping increases by $8.00. 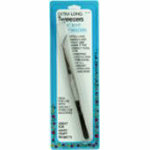 6" bent tweezers with extralong handle and side grips. Gripper "teeth" inside tips of tweezers hold item tightly in place. Perfect tool for inserting and threading needles of all sergeroverlock machines. Useful for many craft projects.